There is natural rhythm in almost everything; same is true about our body. 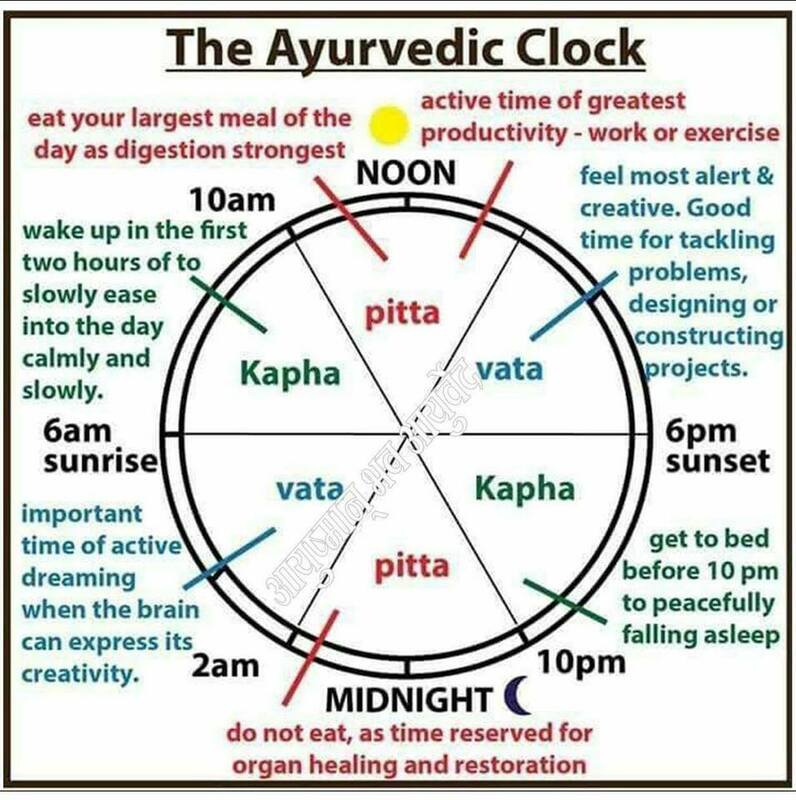 According to Ayurveda our body is always in synchronization or in rhythm with nature. It can be called as Body Clock. Our daily physiology & body functions are always happening according to nature’s natural rhythm. Hormonal fluctuations, appetite, sleep etc. are always in cycle wise rhythm. In today’s stressful, hectic & fast life humans are daily violating or ignoring this rhythm many times & attracting many diseases towards them. According to Ayurveda, the stress of living against these natural cycles is a fundamental violation of healthy living. Emerging science suggests that each cycle of the day as described in Ayurveda supports different activities. Living in sync with nature’s cycles is a powerful lifestyle tool to de-stress the body and mind and begin to enjoy life. In nature, there are two 12-hour cycles that are each divided into three smaller cycles. There are 3 small cycles of 4 hours each in 12 hours. Each 4-hour cycle is linked to certain bodily functions governed by vata (air), which controls the nervous system, pitta (fire), which controls digestion and metabolism, and kapha (earth and water), which controls immunity and structural strength. If we understand the natural cycles & synchronized all activities according to that then life will be much smoother, disease free & relax. 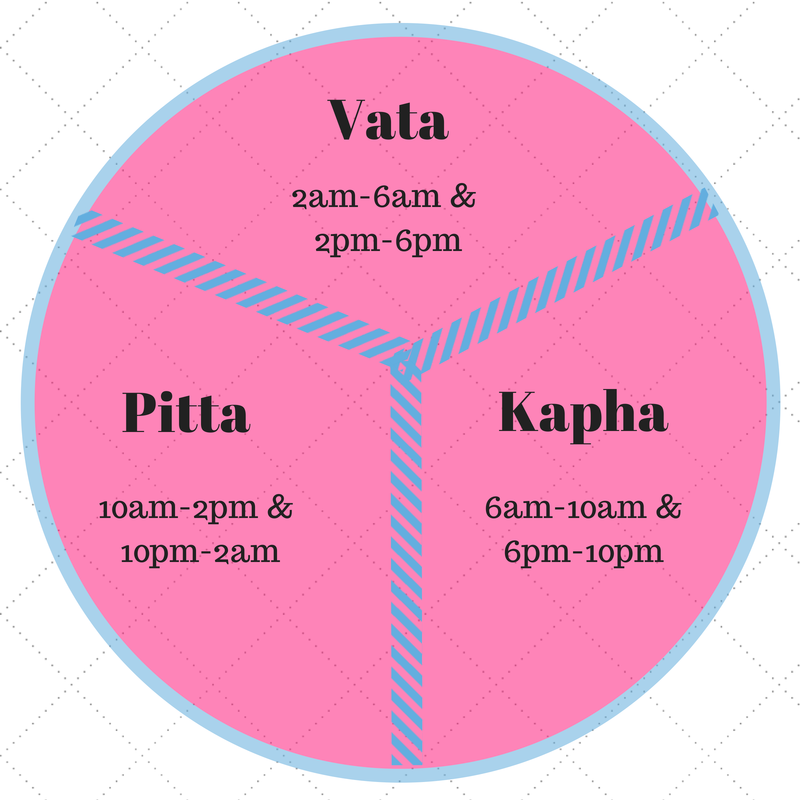 To stay in sync, you should wake up before sunrise, when vata is transcendent. Once the sun is up, we begin to fall under kapha’s earth- and water-like spell. Hitting snooze when the alarm goes off at 6 a.m. may feel delicious, but if you don’t get up ’til 7, the dense, dull, heaviness of kapha will start to color your physical and mental experience. So, waking at dawn, just before the birds, is ideal (traditionally 5:30 a.m.; maybe 6 in your time zone). That way you will start off the day in rhythm with nature’s light and will benefit from vata’s mobile, clear, ether-like qualities, which support your meditation practice. 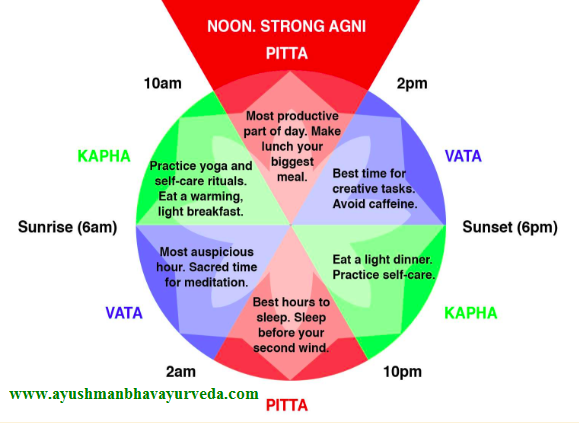 Ayurveda also encourages us to eat our primary meal in the middle of the day, when the fire of pitta dominates. Pitta supports our ability to digest all things—food, thoughts, and feelings. The metabolic aspect of digestion, our agni, does its best work midday. Eat later in the day, and your body will have more difficulty processing your meal. The same holds true for eating a big meal in the evening. Ayurveda recommends a light supper instead so your body can finish digesting your food long before bedtime, and you’ll be able to transition from being awake to a more restful state (what ayurveda calls “light sleep”), necessary for sandman success. At about 6 in the evening, we move again from vata to kapha dosha. The same kapha energy—dull, slow, stable, heavy—that makes it difficult to wake up with ease after sunrise now supports our move into sleep. (Kapha types generally like to go to bed early.) If you tune in, you will start to feel the body and mind’s fatigue and recognize your desire for a good night’s sleep. At about 10 p.m., the midnight oil lamp of pitta takes over from drowsy kapha. The body uses this four-hour period (from 10 p.m. to 2 a.m.) to digest experiences, emotions, and any remaining food from earlier in the day, and to repair and renew itself. Because pitta is fiery and hot, if you fight through the drowsiness of kapha time and stay up too late, you’ll catch a second wind that can keep you up to all hours—and you can kiss any hope of a good night’s sleep good-bye. When you finally do doze off, staying asleep can be challenging because, as pitta time gives way to vata time, the doshic qualities become lighter, subtler, and more filled with movement. 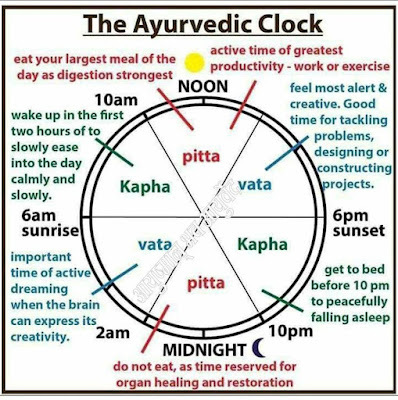 In fact, according to the ayurvedic clock, we start the process of “rising” around 2 a.m. If we continue with restlessness until dawn, we miss the benefits of sleep that support body, mind, and ojas, our deep vitality. Aligning our hectic modern-day lives to the ayurvedic clock can prove challenging to say the least, but making the effort can lead to a big payoff. Many of today’s health problems—insomnia, heartburn, anxiety, and depression—are directly linked to the lack of balance in our lives. Matching our mealtimes, wake/sleep cycle, and general activities to the cycle of doshas will help restore that balance—and our good health. Connect your Body clocks with flow of nature’s cycles, and you will live a life of balance and vitality. 1. Turn off the TV at least an hour before bed. 2. Resist online anything—shopping, Twitter, Facebook, news gathering, or working. 3. Use that extra hour for self-reflection, journaling, restorative yoga, or meditation. 4. Treat yourself to a foot massage. Rub lavender-scented warm sesame oil on your feet and pull on a pair of old socks. 5. Put on your favorite deep relaxation CD or yoga nidra CD (earlier in the day) to help you practice resting and to take the edge off the nervous system. Doing yoga nidra too close to bedtime could refresh your energy instead of moving you into deep sleep. 6. Make yourself some warm milk laced with special sleep-inducing herbs.